Founded in 2011, Rodhus studios provide workspace for creatives. It houses over 30 makers,designers and artists here at the Brighton site. They range from photographers, through to woodworkers, doll makers, screen printers, musicians, fashion and product designers a hackspace and more besides. Previously the Hollingdean Road site was the home of Horsell Electrics an established, family run lighting company. In 2010 Horsell Electrics was sold to the Drallim Group and the lighting business moved to Shoreham, leaving a big empty factory to fill. An industrial building on this scale is rare in a city like Brighton. While not entirely suited to modern ‘lean’ manufacturing techniques, the factory is however an ideal space for smaller organisations to work and share thoughts and ideas. The aim has always been to preserve the factory as a vibrant work hub where people physically make and do things. The city of Brighton has a burgeoning creative sector with many home based start ups. Brighton has over 4000 people working in the creative industries., Rodhus offers the opportunity for these people to take the next step. 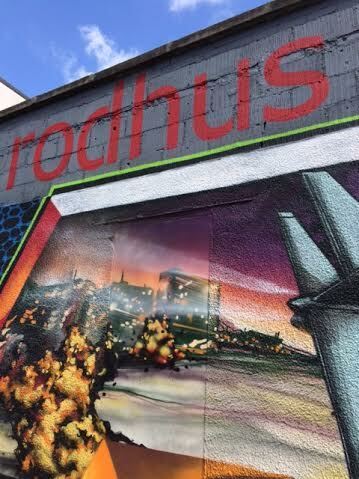 In essence, Rodhus is a community of creative businesses under one roof, a collaboration that allows for cheaper overheads with the added benefit of interdisciplinary influence and support. Brighton born Richard Ainsworth is the owner/manager of Rodhus. A former Product Designer in the lighting industry and later director of Horsell Electrics. He continues to re shape Rodhus in response to the community it houses. Collaborations, events and educational links are all current plans in the pipeline. Richard is also one of the founders of the Creative Hub of the Brighton and Hove Chamber of Commerce. Rodhus – why the name? The name means Red House or perhaps Messy House. Rodhus Klit is a holiday destination on the North Coast of Jutland with chalets and campsites – “I went there on holiday with my parents as a child. Imagine white sand dunes and a clean beach that went on forever with washed up jellyfish everywhere – the water was so cold and I didn’t want to go in because of the jellyfish. It was Denmark in the early ‘70’s – someone had tied sea shells to the bottom of the top bunk and it was light at 11 at night – that’s what I remember – that and my Dad’s green Opel Rekord. He fell in love with Denmark and all things Danish, art and furniture included – some of this may have rubbed off on me. Rodhus is a tribute to him”.